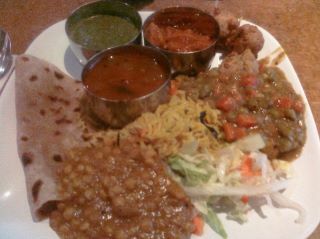 Tiffin Wallah – South Indian Vegetarian Cuisine- NYC – Come for the lunch buffet and the dosas! I think I have mentioned this place before, but I went to Tiffin Wallah this week, after not going there for several months. I had gotten up a little late and had no time for breakfast. I went straight to a client I had that morning and cooked for 3 hours. By this time, it was noon and I had not even had a drop of water. Needless to say, I was STARVING! I didn’t want to spend a lot of money, but I wanted something delicious and filling and then I decided to go to Tiffin Wallah. I know they have a great lunch buffet, but usually, when I go it’s too late and I miss it and end up having one of their delicious dosas for dinner. For once, I was free and had the time to go there at lunch time. 7.95 for an all you can eat Vegetarian Indian lunch. I am a carnivore, but this is the one place I go, where I don’t miss the meat. Their food is just so flavorful and delicious. Meat – what’s that – who needs it? Nobody – if they are eating at Tiffin Wallah! I started out with a delicious cup of Masala Chai. Spices were not just dumped in at the end. You can tell it was all brewed together to perfection. So flavorful I did not even need to add sugar, like I usually do. Then I went to the buffet. The sidebar includes a large variety of chutneys – tomato, tamarind, coriander, coconut and a few others I did not even know what they were. I could have asked because their staff is super friendly and always willing to answer any questions you may have of Indian food, but I was satisfied with the ones I knew. The buffet included two types of dal, three vegetable curries, some kind of fried balls (insides were ground dal, I think – they were so delicious I really didn’t even bother to ask the staff what it was), pulao, chappati roti and saambhar. The roti’s were freshly made – warm and comforting. The food is not very spicy. They leave it up to you. Just add the saambhar and you can make your meal spicy or not – whatever your preference! The restaurant is also certified Kashrut, so if you keep Kosher and love Indian food, don’t forget to try Tiffin Wallah, located at 127 E. 28th street!